Mhmm. I agree. Most of the current items were a bit screwed up But the drill looked really nice. Right I have added most of those textures to the IC2 item sprite sheet, expect for the ones that already had JSTR textures. They look amazing I have to say, I was wondering if you know who made them by any chance? If you download his work you will find that none of the items are messed up. Shame as it would have been nice to credit them, or even see if any more textures were made. Reminds me of this thread over at the MC Forums I found a few weeks back, doesn't seem to contain much though and it doesn't appear much progress was made, but it does contain these textures. Wow, I didn't know that there was still someone progressing on the textures. I got it off from a different website with no user. And it is a shame Glowstrontium that it would be nice to credit him definitely because if I knew it came from there I would of definitely credited him my self and ask if I could use his textures. John Lemon's is the official mod support? That's depressing. Most, if not all of his blocks look like they are from a different texture pack. Wow, someone has bad taste. Not sure if anybody has said this yet, but if you go into the Google drive folder, link is in the op, and you scroll down until you find the file called "ROLLING_CHANGELOG.txt", that is the current changelog, and all of the updates will be posted there. If anything major happens, for example, a support of a new mod or so, we will post in this thread. I'll notify people when we make major changes, but no versions, just simplicity. God darn, stop spamming. You literally just said what he said. 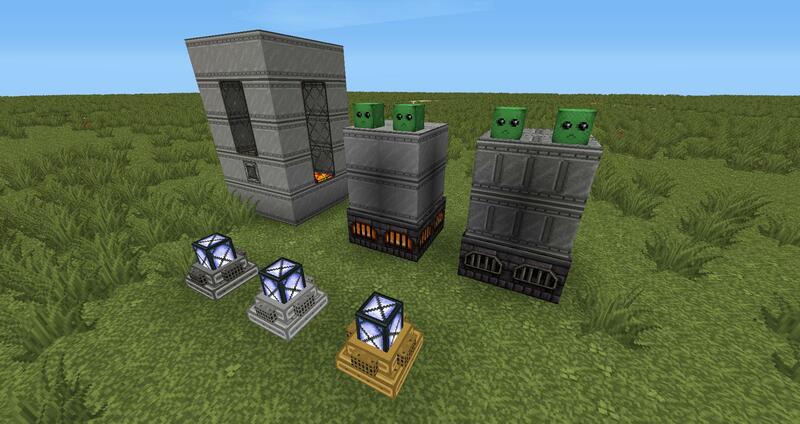 Some cool new power generation stuff has been added, although it's only for MC 1.3/1.4 so not compatable with Tekkit (the RC texture path has changed so it won't affect any of the 1.2.5 textures). EDIT: What are those creeper heads BTW? I haven't worked much on CC, Laz worked on those, but I think the problem may reside to the version of CC you use. The one in Tekkit (1.3) is outdated and a lot of things have changed in later versions. I think you guys are doing excellent of your progress. I just want to say that when you finish Tekkit. Will you continue to texture the updated mods? Also maybe do new ones too? I was thinking that gravisuit may be a good mod to texture. It's just because I don't really use Tekkit anymore, I use 1.3.2 with all the mods. And some of the textures arn't updated on certain mods. Since we have pretty much finished all of the stock tekkit/technic mods, we're slowly moving into other mods. Right now I'm working on Mine and blade, and after that I hope to texture metallurgy 2, since both of those are compatible with tekkit/technic. Just to let everyone know I've updated the pack to support Railcraft 6.7 and Buildcraft 3.1.8 for Minecraft 1.4.2, although as always there may still be a few bugs or Faithful textures. The only thing that we're able to texture right now is a GUI, a different version of a bucket, and an ore. I'm going to say hold off on it until it starts to become a larger mod. Also, the block showing up weird when held is an Optifine bug, there is a patch to fix it, which I believe should be in the Optifine MC Forum thread.